Pool parties can get a bit hectic. There are kids and pool paraphernalia flying everywhere, screaming, crying, dunking and usually plenty of yellow patches in the water. All of that equals panicked parents. However, a new gadget has arrived to ease the worries of parents who often require tunnel vision to keep an eye on their floaty-wearing young'uns. 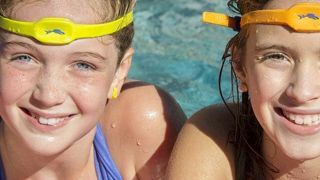 The iSwimband headband and wristband combo can help ensure kids aren't in the water during the middle of a lightning storm and can even prevent drowning. The band sends an alert to the accompanying smartphone app when the child enters the water (when they're perhaps not supposed to) and likewise when the kid has been underwater too long. The iSwimband is priced at $99 (about £58, AUS$105) and is compatible with iOS. A small price to pay so you can actually enjoy a beer at a pool party rather than standing by the pool worried your sibling's bad kid is going to spend the whole time dunking your little angel.